Browse content similar to Series 4 Reversions. Check below for episodes and series from the same categories and more! Mark Hales and Thomas Plant start their journey on the hunt for antiques in Portrush. Thomas Plant and Mark Hales go shopping in Ironbridge. Mark Hales and Thomas Plant face an auction showdown in Pontrilas. Philip Serrell and Jonathan Pratt continue their antique trail in Corbridge. Philip Serrell and Jonathan Pratt look for antiques to auction in Lincoln and Wilmslow. Anita Manning and James Lewis hunt for antiques in Pately Bridge, Yorkshire. Anita Manning and James Lewis continue their antiques shopping in Fakenham, Norfolk. 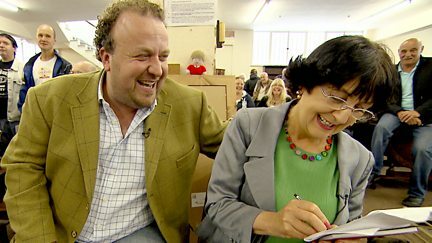 Anita Manning and James Lewis face an auction showdown in Cirencester in the Cotswolds. Charlie Ross and James Braxton continue their Scottish antiques trail in Buckie. Charlie Ross and James Braxton hunt for antiques starting in Blairgowrie, Perthshire. David Barby and Charles Hanson kick off their hunt for antiques in Lichfield. David Barby and Charles Hanson head for their final showdown at an auction in Nottingham.